SKU: SC RG25. Categories: Rings, Shiva Eye. This Round Shiva Eye Ring is really eye catching and will get everyone talking. 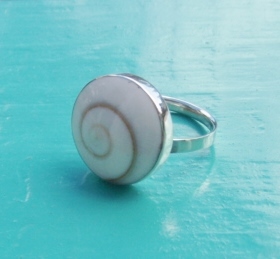 This is a completely natural Shiva Eye shell, set in a Sterling Silver adjustable ring. 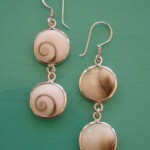 The elegant spiral of Shiva Eye comes from the shell of a Turban Snail. 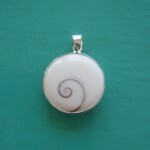 It is it’s operculum or the natural protective door of the shell.